Asbestos can cause serious respiratory problems if the proper precautions aren’t taken while working around it. Working in an older building can present many safety hazards, but one of the most common and most dangerous is the presence of asbestos. Having been such a common material, asbestos is a widespread problem with well-established safety standards. Here are the basics of working on a job site where asbestos is present. Asbestos was used as a manufacturing material all the way up to 1981. It was commonly used in insulation, roofing and siding shingles, vinyl floor tiles, ceiling tiles, pipe wrapping, and plasters and cement. If fibers released into the air during construction are inhaled, they can become trapped in your lungs and cause serious health issues. The fibers can also be ingested and get stuck in the digestive tract. Cancer is a serious concern from exposure to asbestos and symptoms can take years to show up. The first step is to assess the workplace for any signs of asbestos. An assessment must determine the presence of asbestos as well as the likelihood of asbestos fibers being dispersed during construction. 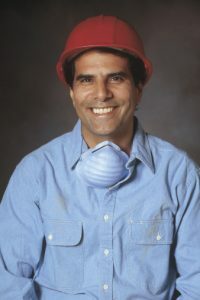 There is a permissible exposure limit for asbestos as outlined by the Occupational Safety and Health Administration of “0.1 fiber per cubic centimeter of air as an eight-hour time-weighted average.” Respiratory protection is a vital piece of protection when working with or near asbestos. A decontamination area is mandatory to keep all dangerous fibers contained in the work site. This entry was posted on Friday, September 16th, 2016	at 9:54 am	. Both comments and pings are currently closed.